The children were taken away from the aunt who had no record, but one of the adoptive parents already had a child abuse charge. In 2006, Sherry Davis of Houston, Texas lost custody of her three children, Devonte, Jeremiah and Sierra, due to a cocaine addiction. The children were taken by Texas’ Department of Family and Protective Services and temporarily placed with their aunt, Priscilla Celestine. However, in December 2006, the children were taken away from the aunt, even though she had no criminal record, a steady job at a hospital, had raised her own daughter and moved to a bigger house accommodate the children. The reason why? The children saw their biological mother, which was against court orders. In 2007, the aunt started filing several petitions. The Oregonion reports that the attorney who represented Celestine at the time “agreed the children shouldn’t have stayed with their parents, but she thought the courts acted too rashly in removing them from their aunt.” She also said, “They have an aunt who I truly believe in my soul and in my heart would have made a difference in those children’s lives.” By 2009, Jennifer and Sarah Hart adopted Devonte, Jeremiah and Sierra while there was still a pending case on the aunt’s last appeal. How heartbreaking that the state of Texas gave the children to a stranger, who already had a child abuse charge in 2008, and took the children away from an actual relative who had no record. On March 26, Devonte Hart, his five siblings and his adoptive parents were reportedly in an SUV that went off a cliff in Northern California. His adoptive parents Jennifer and Sarah Hart, both 39, and three of the children, Markis Hart, 19; Jeremiah Hart, 14; and Abigail Hart, 14, have all been reported dead. 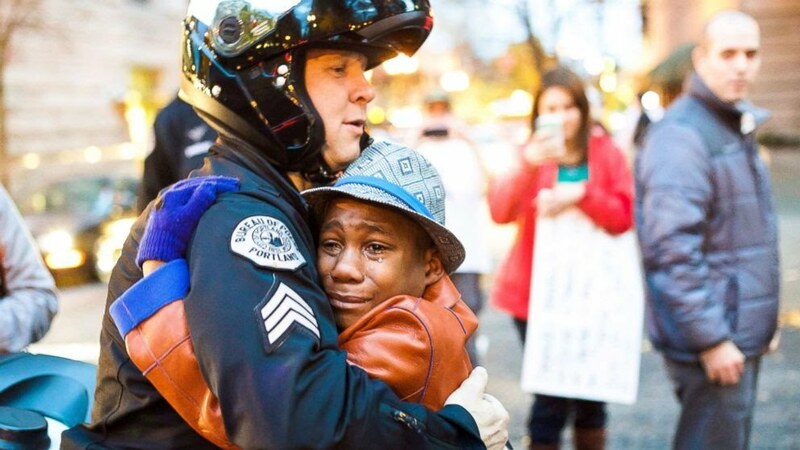 Their three other adopted children are missing, 16-year-old Hannah Hart, 12-year-old Sierra Hart and 15-year-old Devonte, who is known for a viral photo in which he is hugging a police officer in November 2014. A body of a Black female has been found, which authorities believe could be Hannah or Sierra, but are waiting for an autopsy report. The family lived in Woodland, Washington, near Portland, Oregon, and were reportedly on a road trip. Authorities believe the crash was intentional from the mothers. There were ten years of child abuse accusations from starved children with missing teeth to begging neighbors for help to at least one of the children, Hannah, jumping from a two-story window to runaway. Sherry Davis hopes once the bodies are found she can bring them back to Texas. Our thoughts go out to these beautiful children.